I must say that David Tossell's books have always left a favourable impression upon me. After reading his books on the well-known 1976 England and West Indies Test series, Grovel, and a further book on England's captain during that series, Tony Greig, David has very successfully moved to the modern day with an account of his summer in 2015 with the England Women's team: a year in which they tried but ultimately failed to retain the Ashes..
David was given free rein to be with the lady cricketers throughout the summer, sit in on their team meetings and generally be around the team for the whole of their Ashes summer. His is not, therefore, a fly on the wall account and, whilst he makes no secrets that his loyalties lay with the England ladies, his book does read passionately yet comes across in an unbiased way. Naturally, it comes at an interesting time in the ladies' game with the England team now being professional. Much has been made of it and, inevitably, given the loss of the Ashes over the three formats, criticism has been expressed which, through the discussions David Tossell had with the players and staff, was accepted as being part of the game and position they have found themselves now in..
One inane point intrigues me here. A small one admittedly but the female England side is called the England Women, the book - and I suspect many supporters - refer to them as girls and captain and female cricketing legend, Charlotte Edwards, better known in cricketing circles as Lottie, calls them, quite appropriately, ladies. We can be sure that they are female and also very decent cricketers. The Girls of Summer is excellent as we get to know more about the cricketers and they sound, all things considered during a pressured summer, an amiable bunch. Okay, some of their nicknames may not be especially imaginative with the exception of Heather Knight who attracted the name Trevor after a misunderstanding. The professional status does have a bearing on the book - more is expected of them, maybe inadvertently followers and supporters of their game, myself included, expect them to win more. As is often the case, though, perhaps their results aren't quite as impressive as they were, say, two to three years and therefore criticism follows. The ladies have, though, embraced this and aim to do as well as possible. Times continue to change and I am happy to say that the first time I went to an England Women's match at Bath around five years ago, I went not really knowing what to expect. I had seen a match probably in the late 1990s on television which had made me almost weep: you could see the effort expended - and this was not an English side playing - and I willed them on but it was so far removed from the male game. At Bath, the sun shone, spectators sat on plastic chairs on the boundary’s edge, it was an idyllic setting with perfect weather and, later, spectators could mingle with the players after the match. What the cricket would be like intrigued me but suddenly the bliss vanished when Katherine Brunt roared in from one end, Isa Guha was no less impressive at the other end and I realised that the times since I had seen that match on television had changed vastly. Times have doubtless changed since and one hopes that the same joie de vivre still exists. Sport in general is such a big drawer these days that inevitably there is a vast support staff. I have the utmost admiration for them but, as David Tossell includes conversations between all people attached to the team verbatim, there is inevitably a fair amount of jargon which sometimes, I freely admit, I can only get the gist of! Of all those interviewed, Katherine Brunt - described as the heartbeat of the team - and Sarah Taylor sound amongst the freer-talking ones. The England Women's team should remain in good shape with the excellent Clare Conner at its helm. Paul Shaw, who guided the cricketers, as Head Coach/Head of Performance decided to leave his post after the Ashes and has been replaced by Sussex's Mark Robinson but, despite losing out in the semi-finals of the recent World T20 competition, the ladies will be keen to return to winning ways this summer. 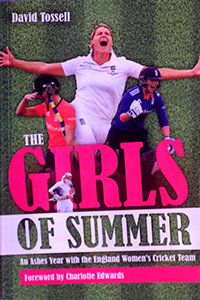 David Tossell has again produced an excellent account which will allow the reader to learn that much more about the England Women's cricket team and I would urge anyone interested in women’s cricket to pick it up.